An Italian heirloom variety with dark blue-green, narrow leaves up to a foot long. Heavily crinkled texture with strong flavor. .Related to broccoli, cauliflower, Brussels sprouts and collard greens. Believed to have anti-cancer properties. Young tender leaves are best sautéed quickly. The larger, more mature leaves make great additions to soups and braises and are favored by a long, slow cooking process. Lacinato Kale has been growing in Campania, Italy for centuries and predates pizza and pasta dishes of the region. 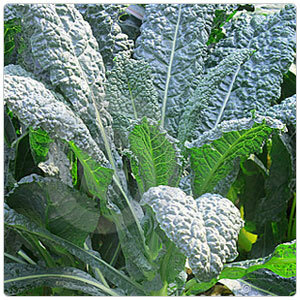 Lacinato is not a term widely used in Italy, it is better known as Cavalo Nero.